The only downfall of milk soap? 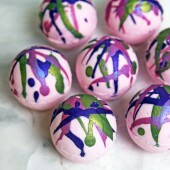 It’s trickier to make than soap made with water. 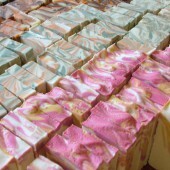 When adding lye to any soap making liquid, the temperature of the liquid can reach up to 200°F. Milks contain natural sugars, and when these sugars reach high temperatures, the milk will scorch. Scorched milk does not smell pleasant, and the milk turns from a creamy white to a golden yellow. 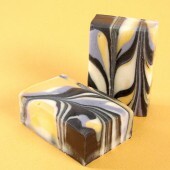 Making soap with a scorched lye/milk mixture will not ruin your soap. 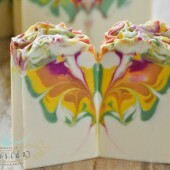 But, the dark color of the milk may alter the colors in your soap. 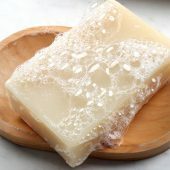 The smell of the scorched milk may also give your soap an unpleasant, ammonia-like smell for up to 10 days after the soap is made. 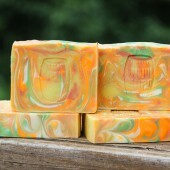 To see an example of scorched milk, check out the Goat Milk Soap Tutorial on Soap Queen TV. There are a few different ways to deal with this (everything from water discounting and adding the milk at the end, doing half milk and half water and more). But my favorite method has to do with temperature. The key to making soap with milk is to keep temperatures low by freezing the milk beforehand. 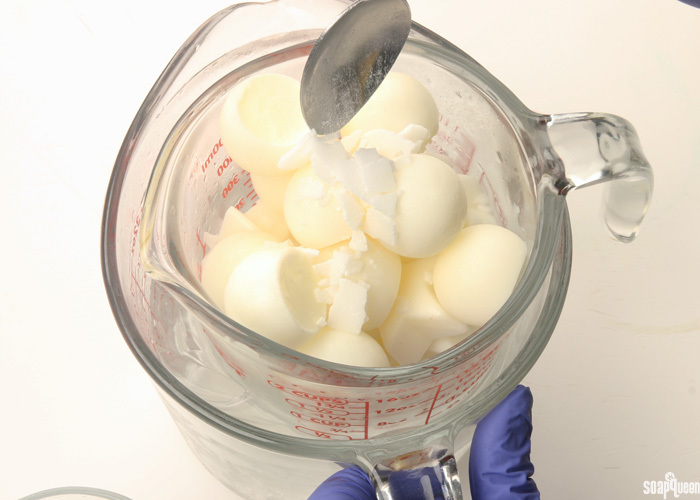 To do this, measure out the amount of milk that you’ll need for your recipe. If using a milk powder, measure out your distilled water and add the appropriate amount of powder and stir until fully incorporated. 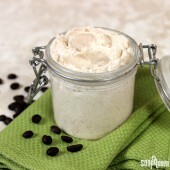 If you are using Bramble Berry’s goat milk or coconut milk powder, we recommend 1 oz. 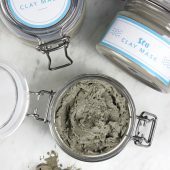 of powder per 8 oz. of distilled water. Pour the measured milk into ice cube trays, and place in the freezer. Allow the milk to fully freeze. 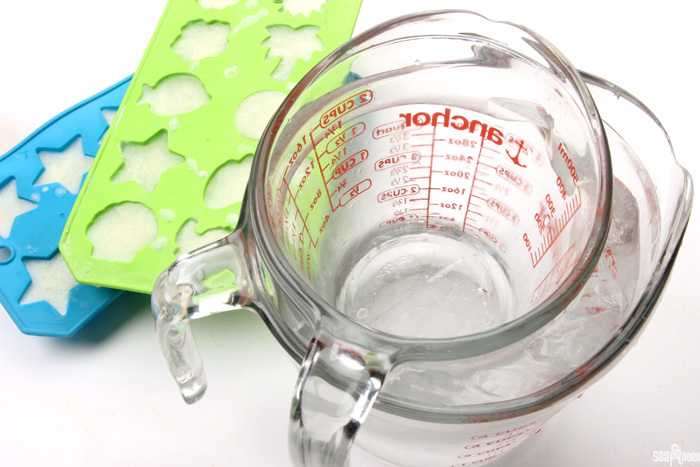 Once you’re ready to make your soap, measure the amount of lye needed for your recipe. Place a mixing container that is large enough to comfortably fit the milk ice cubes into an ice bath. Place the milk ice cubes into the container resting in the ice bath. 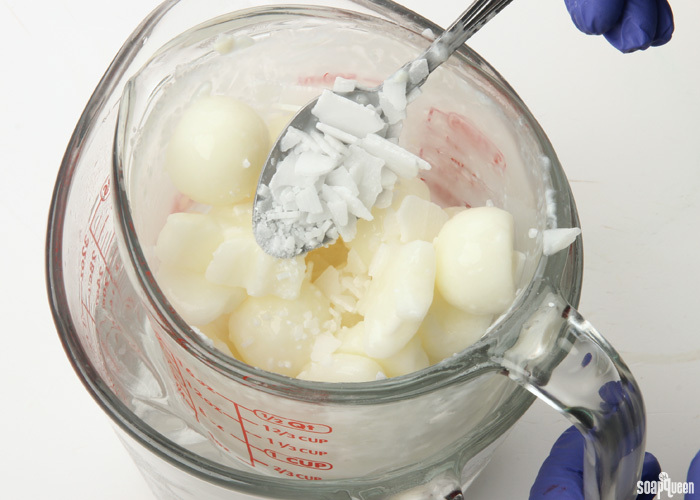 Add one spoonful of the measured lye onto the milk ice cubes. Stir the lye flakes with the ice cubes. Continue to slowly add the lye into the frozen milk, and continue to stir. Keep stirring! The process of adding the lye flakes into the frozen milk will take about 10 minutes. Adding the lye slowly and stirring in between each addition will help keep the temperatures low. If you were to add the lye all at once, the temperature of the milk would rise very quickly. You will begin to notice the milk slowly melting. Continue to add the lye in small amounts, and stir, stir stir! Once all the lye has been added, continue to stir until you are 120% sure that all the lye flakes have dissolved. 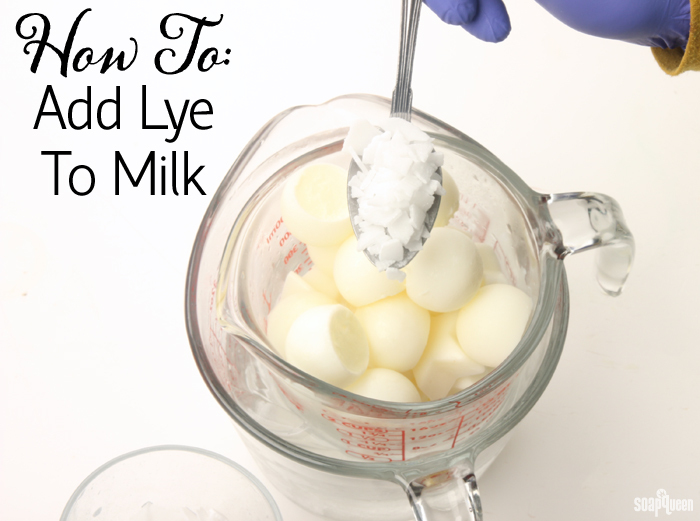 Because the frozen milk keeps the mixture cold, the lye takes a while t dissolve. Patience is key! Any undissolved lye in your soap could cause skin irritation, or even lye burns. 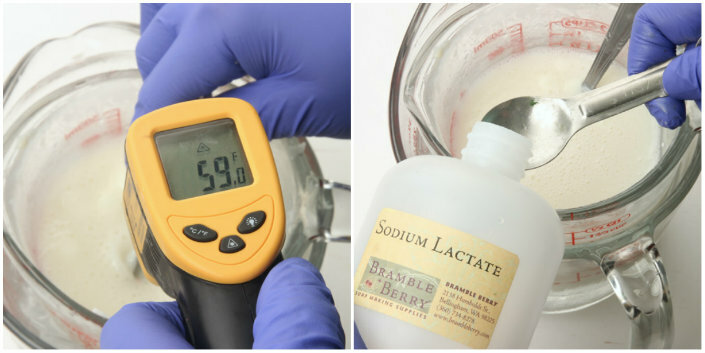 Once lye has completely dissolved, the milk should be around 50-65° F. If you’d like, add sodium lactate to the lye mixture at a rate of 1 tsp. 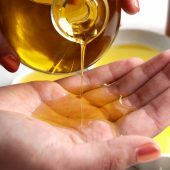 per pound of oils. 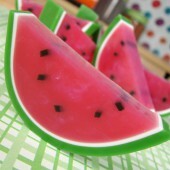 It helps the soap pop out of the mold faster, and creates a harder, longer-lasting bar of soap. Stir thoroughly to mix in the sodium lactate. Your milk is now ready to use! Ideally, your lye and milk mixture should be around 70° F. Much hotter than this, and your milk may begin to scorch. 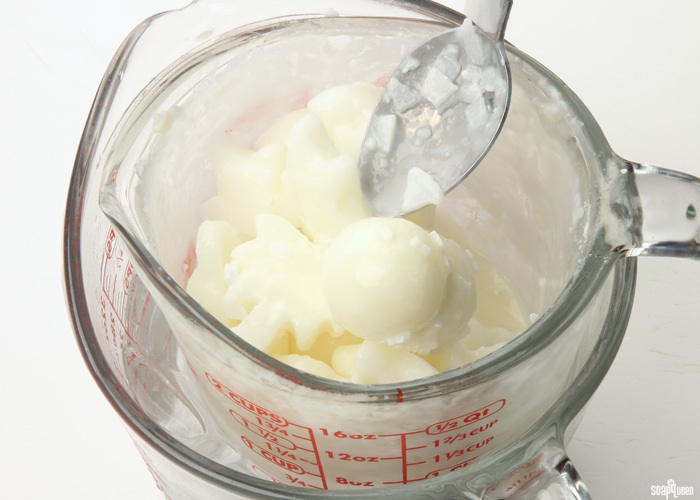 Add the milk to your hot oils and butters like normal, and proceed with your recipe as usual. 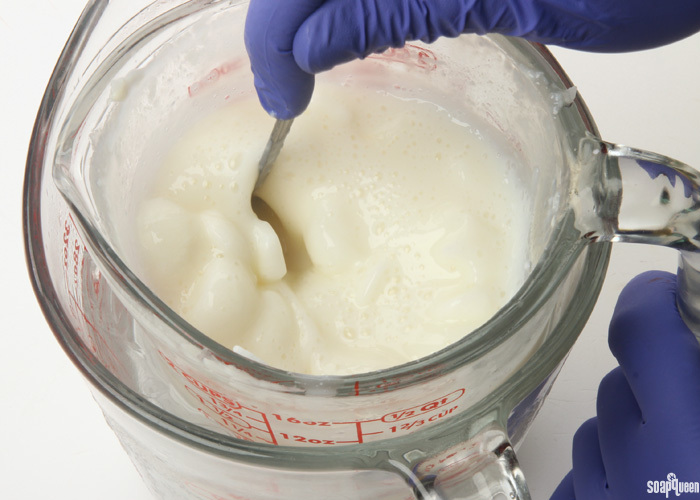 Soap made with milk should not go through gel phase, as this will scorch the milk. 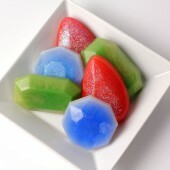 To prevent gel phase, many soapers like to place their soap immediately into the freezer or fridge for 24 hours after pouring into the mold. 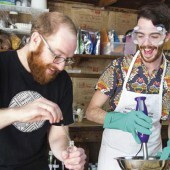 Have you ever made soap with milk before? What was your experience like? If you have any milk soap tips, I’d love to hear them! I have made cold process soap for many yeas and just tried goat milk soap using fresh goat milk. I used my go-to recipe and replaced the water with 100% goat milk. I froze the goat milk, added lye slowly and was able to keep the temp down and retain a nice milk white color. When combining the oils and milk/lye I blended a bit too long (it got too thick to pour) so I spooned it into silicone molds and into the freezer it went for 24 hours. When thawed I took it out of molds but it was very soft and that didn’t go too well. 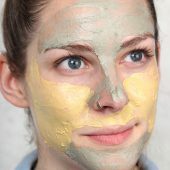 I just read another comment that mentioned leaving it the mold for another 3-5 days – is that where I went wrong? Thank you ! 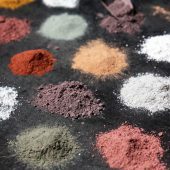 I have a question if I am not comfortable with using milk can I add powdered milk as an additive with my powdered clays? I have seen this done and feel this might be better for me rather than chance the milk scorching going through a gel phase. I HAVE ALWAYS USED MILK INSTEAD OF WATER. WE USE ALMOND MILK AND NEVER HAD ANY PROBLEMS WITH IT. WE USE THE MILK RIGHT OUT OF THE FRIDGE. IT DOES NOT GET HIGHER THAN 150 DEGREES. WE ALSO FREEZE IT AND WHEN FINISHED I COVER IT THE SAME WAS AS USING MILK AND LET IT SET OVER NIGHT. DO NOT US HALF AND HALF CREAM. 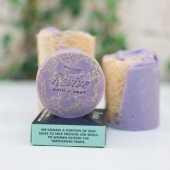 THAT SOURS AND YOUR SOAP WILL NEVER HARDEN. I TRIED THAT AND I HAD TO REBATCH IT. I NEVER TRIED ANY POWDER MILK. WE JUST POUR THE LYE OVER THE MILK TO MIX. JUST THE WAY I HAVE BEEN DOING IT FOR ABOUT 40 YEARS. I USED TO USE REGULAR MILK THEN WENT TO GOATS MILK BUT DIDN’T LIKE IT AS MUCH. NOW ALL I USE IS ALMOND MILK AND MY CUSTOMERS GOES WILD. ON THING ABOUT ALMOND MILK IS THAT IT MAKES A SMOOTH FOAMY SOAP WITH THE COCONUT OIL I USE. I HAVE NEVER HAD PROBLEMS. JUST TAKE YOUR TIME AND DON’T OVER WHIP IT OR STIR IT. I TRY NOT TO MAKE A TRACE WITH FLORAL SCENTS. USE IT MORE LIQUIDIFIED SO I DON’T HAVE SEIZE. I MADE LYE SOAP WITH MY GRANDMOTHER GROWING UP. ALSO IF YOUR SOAP GOES TO SEIZE HAVE A BIT OF YOUR OIL NEXT TO YOU AND IF YOU CATCH IT FAST ENOUGH POUR SOME OIL IN IT. I HAVE SAVED MANY BATCHES OF SOAP LIKE THIS. I mix my oils & lye liq. when they are within 5 degrees of each other, usually around 95 to 98 degrees. not sure, if this would work if the milk for down to 70 degrees …can it ??? Loving your posts! I am also new to soaping. What else is a dairy goat farmer to do with all of this milk? Lol. I have made several batches and I keep getting white crystals protruding from my soap. The last two batches seem to not have but one or two but what can I do to correct this? I was told that I took too long to process the lye and milk. At the beginning I watched videos of how others did it and they processed the lye and milk for an hour or so. Is that too long? I wish I knew how to upload a picture so I could show you the spots on the soap. Thank you. Tammi (January 29, 2017 at 6:48 pm) you can upload a photo to Bramble Berry via Facebook by first having the photo on your computer’s hard drive. If you don’t know how to do this I can walk you thru it. Log into Facebook, type Bramble Berry into the search bar at the top left of your facebook page (you should see a magnifying glass along the box). You will see the maroon and green sign with their name on it and Bellingham, Washingtom below their name . Once on the Bramble Berry page, click on the blue button that says “Send Message” and it is below their Cover Photo and to the right. Once you do that a box will open so look at the bottom left and find icon with the square that has the mountains and round sun. Click on that icon and a box will open which will allow you to navigate to the folder that has the photo(s) you want to send. Looking to the far right of that box you should be able to locate your Photos folder by scrolling down until you see it. Click on it and then find the particular picture(s) you wish to send them. Just DOUBLE click on the photo you want to send and it will automatically be sent into the message box. If there are more than one picture then click once again on the icon with the mountains and go to the next photo you want to send and, once again, DOUBLE click. There is a short cut that would allow you to choose multiple photos but I don’t want to confuse you. Hope this helps. If you need more help I give this site permission to share my email address with you via your email. 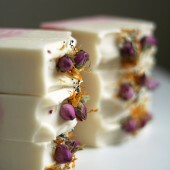 I just made some Lavender Goat Milk Soap yesterday. I put it in the freezer for 24 hours right after molding (just a regular loaf mold) and just took it out to cut into bars. My first cut ruined the first bar because it won’t slice nicely, but instead chipped away into a million pieces! 🙁 so sad. I guess this may be an amateur question, but do I just need to let this thaw completely before attempting cutting again? I thought being totally frozen would actually make it easier to slice – not harder. Should I thaw at room temperature, or place in the fridge? Any idea how long this will take before I can slice? Thank you!! 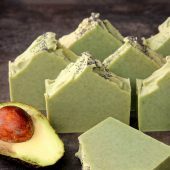 I am fairly new to soap making and this website always ends up giving me lots of great articles and recipes to pin to my Pinterest and refer to constantly! Well I think it may be beyond salvageable now….I didn’t read your response until after I cut into it again tonight (24 hours in freezer after soaping + 24 hours sitting out uncovered at room temperature), but here’s what happened: I was able to cut a little better but it mostly still crumbled apart. On the outside it was still a beautiful creamy white but on the inside it was turning pale orange-ish and smelled rancid. What happened here?? I’m a little discouraged about my first milk soap experience! Dangit I already trashed it – sorry! But I don’t know that it was partial gel phase because wouldn’t that just leave a circle in the center? This was all over the inside of the bar. My oils and milk were not rancid to begin with. I was careful to freeze my milk before adding the lye. I think I actually let the milk/lye mix get up to around 80 degrees F before I added it to the oils. Would that have been the problem? Nothing smelled funny to me before bringing it to trace. BUT I do remember now that it barely blended up. As soon as I added it to the oils it got extremely thick. The oils were still sitting on top so I had to stir them in with a spoon because it was such a thick thick trace I could barely doing anything with it. I think I may know what it is! Sounds like you may have gotten false trace. That happens when the cool lye water is added and starts to solidify the hard oils in your batch. It makes it looks like the soap traced when it hasn’t yet. So, that means your bars were likely separated, causing the crumbling. Awesome thank you! The false trace does sound like the correct diagnosis. So…I know my milk/lye mix was up to at least 70-80 degrees. But you’re saying the problem was with my oils? I needed them hotter? (I think I did try to get them at like 100 degrees F to be closer to the lye mix). And maybe also add more soft oils to my recipe so this doesn’t happen as rapidly? I may (hesitantly) give this another try soon….. ALLOW IT TO THAW. SORRY ABOUT CAPS I AM PARTIALLY BLIND. I HAVE FOUND IF I MAKE MY SOAP AROUND 110 TO 115 DEGREES FOR BOTH MY OILS AND MY LYE MIXTURE. THIS GIVES ME A HARDER SOAP. I DO NOT STICK BLEND A LONG TIME. I STIR JUST ENOUGH TO MIX EVERYTHING WELL. THEN I ADD THE SCENTS AT THE LAST MINUTE BEFORE USING MY MIXTURE. ONLY STIRRING ENOUGH TO BLEND. I DO NOT BRING INTO A MED TO HARD TRACE. THEN YOUR SOAP WILL SEIZE. 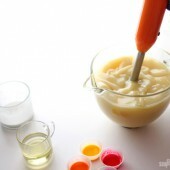 IF YOUR SOAP MIX IS THEN STILL TO MUCH A LIQUID THEN USE THE STICK BLENDER. NOT MUCH FOR YOU MAY SEIZE. I RATHER USE MY SPOONS AND WHISP. I HAVE MORE CONTROL. 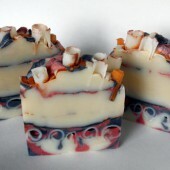 I’m new in soap making, question when using fresh goats milk do I need to bring to a broil before freezing it? Thanks for the tips! I’m relativity new to soap making, and this is going to be my first attempt at goat milk soap. 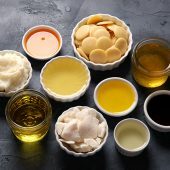 If my milk/lye solution is going to be around 70 degrees, what temp should my oils be around? I thought the plan was to normally have them around the same temp. Thanks so much for the great articles! 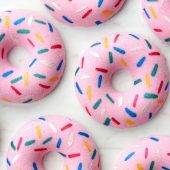 This website has been hugely helpful getting started! Also, forgot to ask….can I just use salt instead of sodium lactate? Wanted to try this today and cant figure out where to get SL local. Using stearic acid in your recipe is a bit different, and may also be tricky to do. 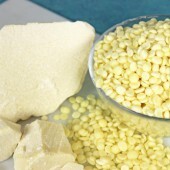 Stearic acid is used at .5% of the oil weight in your recipe. It is added in with your oils. If it gets too cool, it can start to harden in the batch. That means you need to soap at 170-180F. Also, it will accelerate your trace. If you’re working with milk, those high temperatures also means the milk will scorch and discolor. What happens if I decide to allow my milk soap to gel? 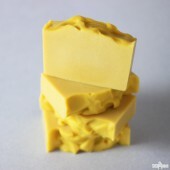 I saw the picture of your honey soap after making it and not placing it in the freezer and I loved the way it looked. 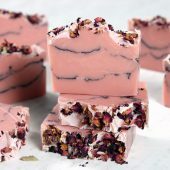 Well, I’ve been screwing up goats milk soap for years now, LOL, I loved the article and was really concerned I could soap at such a low temperature. To make matters even worse I add honey to the mix! My soap turns out great, but looks terrible!!! I do put it in the freezer once done (although I forgot yesterday to do that right away and will have brown soap this time). Next time I will try adding the lye much slower and soaping at a much lower temp and see if I can get that lovely creamy color! Thank you for this post. Very interesting. So, I tried to do that method. Everything was ok. I freeze 30 hours and put in the fridge 8 hours . In the middle I can see a round more dark that the rest of soap. ?? Is it possible to get a gel phase ? I’m confused. Thank to help me. (sorry for my english, I’m french). I tried to put a picture of my soap, but I can’t. 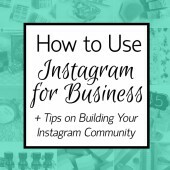 Perfect post and really thank you for your tips! Now i can i measure them on ice condition? After i mold the soap i put it on the fridge for about 20 hours. Then i let it on room temperature and unmold it after 3-4 days…. Looks great so far and really hard as i use a 20% amount of palm oil. hi, my goats milk soap tends to be really soft. The bars never get very hard. What could be the issue? As the powder is added to the lye water, my worry is that the fats will start to rehydrate and reheat that lye. 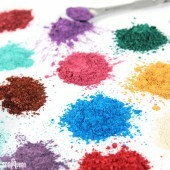 If you do add the powder, I would recommend cooling the lye water in the fridge, then adding the powder. A small test batch would be really helpful to see if that results in any scorching! Hi, this is not a milk soap based question but rather a using frozen liquid question. Despite reading negative posts on using lime/lemon juice in soap, I have a strong hankering to try a small batch myself. My question is can I use frozen lime juice with the lye the same way you would use it with milk? Would I need to keep the soap mixture cool after pouring in the mold or can I insulate? I plan to superfat at 3% hoping it helps with the lye neutralizing the juice. What we did for that recipe is add room temperature lemon juice at trace. 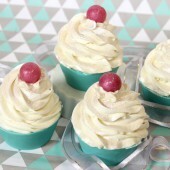 We found that was the best way to incorporate the lemon juice without too many odd things happening. For a 5 pound batch, we added about 4 ounces of lemon juice. Remember to take that out of your distilled water so the soap doesn’t get too wet! Then, add the 4 ounces of lemon juice at trace. Room temperature is best, because cold lemon juice can start to solidify the oils in the batch. I would recommend using the same method for lime juice. If its the lactose in the milk that causes the problems, Soy Milk and all the other non-dairy milks does not contain the lactose, so would there be any problem with it getting to hot? being vegan my self I’ve taken my company vegan also that’s why I’m asking. I’m going to try making a small batch. Hi there! I had the same theory and tried a small batch with soy milk without taking temperature in to consideration. The bar turned brown and the milk did burn, leaving a funky burned soy milk scent. Never again! I was planning on adding colloidal oats and goat milk powder at trace. Would that produce a quality bar with similar properties as freezing and mixing? It should give you a similar consistency to milk that has been frozen and added to the lye! However, because the goat milk powder added at trace isn’t reconstituted in water, it may feel a bit different. I would recommend making a small test batch with oatmeal and goat milk powder added at trace and see what you think. What would the shelf-life be for soaps that contain milk? Would it depend on which type of milk that is being used? Thank you for your help! 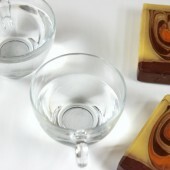 The shelf life of milk soaps will be the same as soaps made with distilled water! This is because the milk in the recipe goes through the saponification process. During that process, the milk is turned into soap, making that shelf life the same as with water. I made this soap this morning and made a ice bath and froze the buttermilk into small marble size bits. I added the lye and after 20 minutes it still had a curdling effect to it. I used it in my solution anyway. Thoughts. It was about 70 degrees. A bit too hot I think. Do you think this was lye undisolved or curdled milk. 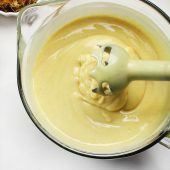 When I blended it, it seemed not to show.. 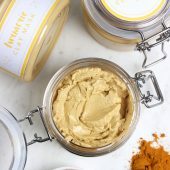 I make Oatmeal Milk and Honey Soap…can I just add the goats milk powder directly to soap batter at trace and still achieve the same results as freezing and adding it to the lye? The powdered goat milk will still add creaminess to the soap! 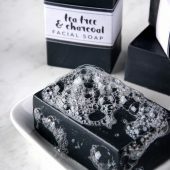 Because we didn’t try the Goat Milk and Oatmeal Cold Process Soap with powdered milk at trace, I can’t say for sure that they will feel exactly the same. You may want to make a small test batch to see what you think! 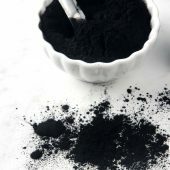 It may also help to disperse the powder with a bit of distilled water (2 ounces or so) before adding it to prevent clumping. If you do mix with distilled water, make sure to subtract that amount from your total water so that batch won’t be too wet. Hi there! I just made a goat milk cold process soap a few days ago. I’m just now realizing that when I doubled the recipe, I didn’t double the milk. :-O I haven’t sliced it yet. Is there anyway to fix it? Thanks so much for your help. When using milk, people often do milk discounts. Milk has extra fat in it that can make it soft, so adding less milk means the soap hardens and cures faster. 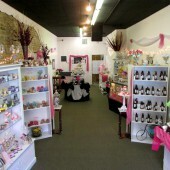 Typically, discounts start at 10% and go from there. Because your soap has half as much milk, it may mean the soap will just harden and cure a lot faster! However, because it has a higher discount than usual, it may be on the dry side. One question. Do I rebatch now or after 2-3 weeks of curing? The bars feel soft and not dry. 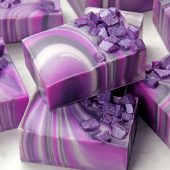 I am new at soap making and I can’t figure out what I am doing wrong. I am making goat milk soap using frozen milk. I follow all of the steps listed above. 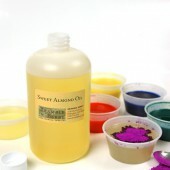 My oils and milk/lye solution are usually about 85 F. My problem comes when I am mixing everything. I add the milk and scents to the oils and start to mix. Usually within a minute or 2 my mixture thickens. It starts out where I can pour it, but within no time I am forced to spoon it into the molds. What am I doing wrong? It it the scents that are causing it to thicken? I thought the temperature of the oils should be 120-130 degrees Fahrenheit? What happens when your milk temperature is 80degrees Fahrenheit?? 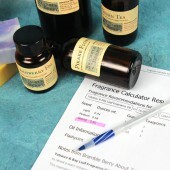 Can your oils be around the same temperature??? 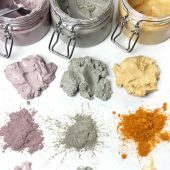 Newbie question….What about goats milk powder? Insulate or not? That’s a great question! 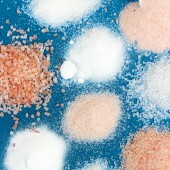 Are you mixing the goat milk powder with water and adding your lye to it, or adding that powder at trace? 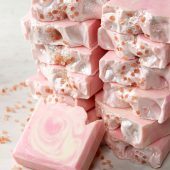 Does a soap recipe stays the same if you exchange the amount of water with part or entirely with goatsmilk? So if a lye-calculator specifies a certain amount of water does that equal the same amount of milk? Tried 100% coconut oil soap with coconut water and coconut milk powder. Also added vitamin E and ROE. I didn’t freeze the milk into cubes, but rather stick the measuring cup into the freezer. After adding the lye it never got very hot, barely above freezing, and my oil cooled down to under 100 degrees. I’ve heard of soaping at room temp. so I figured it would be ok, but it never came to trace. The battery on my stick blender died after about 10-15 minutes and it was still the consistency of a thin batter. Poured it in the mold and stuck it in the refrigerator anyway. After unmolding and letting it come back to room temp. the surface of the soap is very oily. 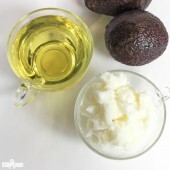 I did around a 25% superfat because I thought the 20% was a little too drying. I’m figuring it’s leeching oil because it never reached trace, but not sure. Ugh, I just figured out what I did. Measure the lye in GRAMS and not OUNCES like the recipe stated! I’ve definitely had some measuring mishaps with my soaps before! I’m glad you figured out what was going on though. How is your soap doing now? It ended up going through partial gel phase, and the milk may have scorched a little because the smell was off just a bit. I’ll try putting it in the freezer instead of refrigerator and report back. I’ve made goat’s milk soap three times now. First recipe I tried called for half water, half milk. Decided I wanted to do full milk after that. The first time I mixed the lye in with slushy goat’s milk and the only problem I had was it got so thick, I had to spoon it into my oils. The next time, I went with fully frozen milk and it thickened but not as much. Will definitely try the ice bath method next time. I’ve never put it in the fridge or freezer and don’t think there was a problem. This method definitely prevents the milk from getting too thick! The frozen milk and ice bath help it stay cool, which in turn keeps it liquidy. Let us know how it goes! I make Hot Process. So would all the steps be the same for HP? Thank You! Because hot process has higher temperatures, the milk will scald even if it’s frozen before adding lye. 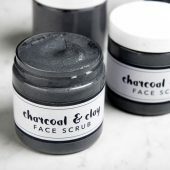 You can definitely still use it if you like, just keep in mind it will discolor and have an unpleasant smell at first. I guess I just jumped in head first, because I have made goat’s milk soap from my very first batch almost a year ago. 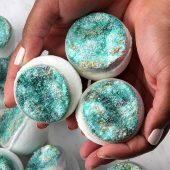 The only time I have used water in making soap was when I recently made a batch of shampoo bars, and then I brewed some chamomile tea as the water. I also pour my milk/lye mixture through a strainer as I add it to my fats and oils. 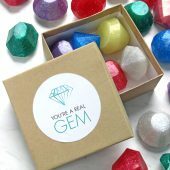 It does indeed help tremendously to catch those random crystals of solid lye that just didn’t happen to dissolve. I also freeze my goat’s milk, which I buy in a carton at the grocery store. However, I do not put the container with the milk and lye into an ice bath, and I have never had my milk scorch. I do take my time, and stir and stir! The color of the soap is darker if I use canned milk. I keep the newly made soap in the fridge for 48 hours before I remove it from the mold. Then I cure it for 6 weeks. It turns out a nice creamy color – not too brown. Sometimes my soap bars develop that layer of “ash”, and other times they don’t. I haven’t yet figured out why it only happens some of the time! It took several tries, but I now have what is my favorite recipe: 50% palm oil, 20% coconut oil, 10% castor oil, 10% olive oil, and 10% grape seed oil. It’s wonderful soap, and so gentle on my skin! My sister-in-law had some treatments on her face for a pre-cancerous condition, and she said the ONLY soap her face could tolerate after the treatment was my goat’s milk soap! Yay! It sounds like you’ve found the perfect formula for working with goat milk! I love the creamy feeling it gives cold process soap. Has anyone ever tried evaporated milk in their soap? If so, does it need to be mixed 1/2 and 1/2 with water or can you use it as is? You can use evaporated milk, just remember to freeze it to prevent scalding! Also, keep in mind cream is a lot thicker than milk. You may want to add a bit of distilled water to help thin it out! 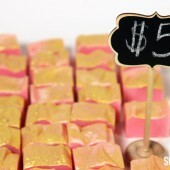 I only soap with goats milk and now would like to begin adding Tussah Silk to my recipes. I’m wondering how to go about doing that because you need a hot lye temperature to dissolve the silk, but yet with milk, you can’t let the temp go up. Does anyone have a method for using Tussah silk in goats milk? 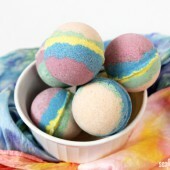 You can also add liquid silk if you like! We recommend about 1/2 tsp. per pound of soap. You can add that at trace with your fragrance and color. 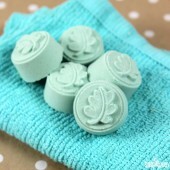 Milk soap feels extra special, everyone i give it to loves it. I did have one loaf of scorched milk soap ,it still made good bath soap, but the scorchiness came through. My favorite was my oatmilk soap I made myself, omg, it was so nice, and everyone loved it. Very easy too, had to freeze into cubes just like the other milks. Also, this method applies to every type of milk out there! It’s a great base technique. This is good information if I ever decide to try it. I’ve always found the notion of milk (especially goat milk) in soap a bit revolting. In my experience only a fraction of customers seem interested in it. Most don’t like animal products (milks or animal fats) in their products; at least here in “hippie” Oregon. But using soy or almond milk might be a good choice to try. Why do you wait until all of the lye is dissolved to add the sodium lactate? Is there a special reason or is it the same as adding it at the beginning? Oh good! I have to add it at the beginning or I forget it entirely. Glad I’m not messing it up that way! Hi all! Don’t be afraid of goat’s milk. 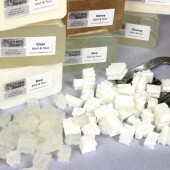 I have made over 1500 lbs of 100% goats milk soap -no water- and it works great! 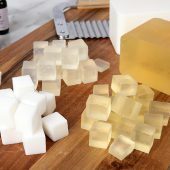 I use frozen raw goats milk cubes with out the extra ice bath and have not had any scorching. The secret is to be patient and add the lye slowly and stir, stir, stir. We soap at around 90 F. I don’t get much gelling -which seems to be more dependent on the scent that I use as well as the surrounding room temp (I live in Georgia and it can get pretty hot in here some days; even with air conditioning). If the milk/lye mixture needs to be 50-65 degrees what temp do the oils need to be when you mix them together? I make goat milk soap, too, for a living. Want to chat? Feel free to email me at [email protected]. I like to use full liquid with my milk soap, half water, half frozen goats milk and dissolve the lye 1:1 completely in the water first. Then I mix the frozen goats milk with the cooled dissolved lye slowly in a sink with ice. I did not like adding the lye flakes directly to the frozen goats milk without dissolving first because the lye reacts with fats in the milk and begins to form soap already. To me, this made it difficult to ensure all the lye was dissolved and difficult to strain as it was too thick. 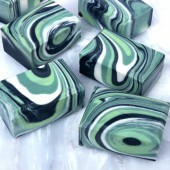 I like seeing and knowing for sure that there are no lye pieces in my soaps! I’ve tried some of the above methods but this seems to work best for me. 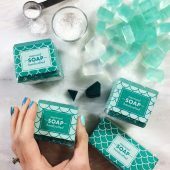 Its definitely trickier than using just water but does add conditioning and a mildness to your soap that takes it up a notch. Ah, so that’s what was happening! I’ve tried this method of adding milk before and was wondering why it seemed as if the lye solution was turning into soap batter! Thanks for sharing. 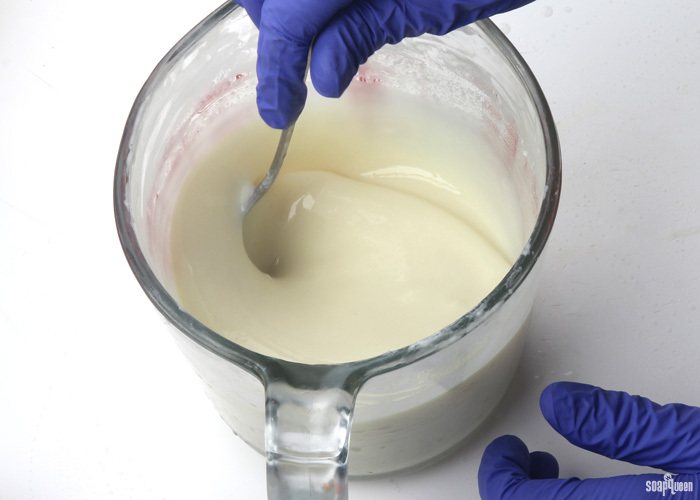 After you have added the lye to the Milk, make sure it is dissolved completely. Some times when you have the milk container in the ice bath it keeps temps so low the lye will not fully dissolve. Also, when pouring the lye+milk into the oils use a strainer. This will help catch any left behind not dissolved lye. I have worked with a lot of frozen liquids with lye, ie beer, coconut milk, goat milk, buttermilk, pineapple juice, tomato. I learned the hard way to always put it through a strainer. That is great advice! Because the milk is cooler and opaque, it is difficult to see if the lye is fully dissolved. Lots and lots of stirring is important. 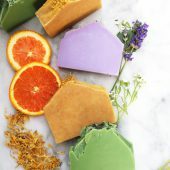 What is a difference between soaps for different body parts- body soap bar, face bar, hair shampoo bar? 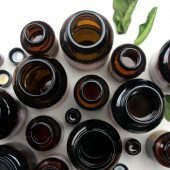 And I do understand to use different essential oils, for example, that might be good for dry skin, or acne, but what is different in the base oils or the main recipe? Please explain! Thank you!!! 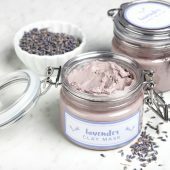 Please, also post more recipes or suggestions for using your extracts in CP soap. Thanks!!! That’s a great question! 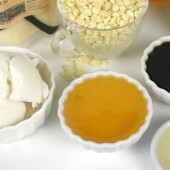 While the base oils are similar for face, body and hair soap, the amounts are often slightly different. 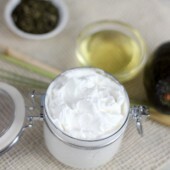 For instance, a facial bar may have more olive oil, as olive oil is gentle for sensitive facial skin. 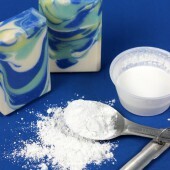 I use powdered goats milk in my soaps. I let my melted oils and lye cool until the mixing bowls are just warm, not hot to the touch before combining. I then mix the goats milk powder with some liquid oil from my batch and add it at trace. Easy peasy, and I don’t have to fool around with frozen milk or submerging my mixing bowl in an ice bath. Soap turns out great with minimal discoloration. This is what I do. It works great. I’ve also used dried buttermilk. I find it waaaaaaay easier to allow the frozen milk to get down to a slushie quality first, then add in the lye. I was fairly intimidated when I first started making milk soap as well, especially because you can’t see if the lye is fully dissolved. It helps to just keep stirring way longer than you think you need to! It also helps to monitor the temperatures. If it’s cooler, the lye will take longer to fully dissolve. I’ve also found it helpful to scoop the bottom of the container and lift the spoon up to the surface. If I see any undissolved lye, it means more stirring! Great tips, Thank you! Just a question, you say to add to your oils as usual, should the also be around 70 degrees? Or I should say with in 10 degrees of your oils? I intend to place mine in a mini fridge that I keep in my soap area so no food oops can happen. You’re welcome! We recommend having your oils around 100-130F. That way any solid oils or butters stay completely melted. Typically, we recommend having your oils and lye within 10 degrees of each other. However, there will be a difference here because the milk needs to stay cool.